a. Scraping is pretty simple. There are two kinds of scrapers: thick and thin. I prefer the thick scrapers, but try them both and see for yourself. Take the scraper, and hold it at 45 degree angle, or about how it is held in the photos. 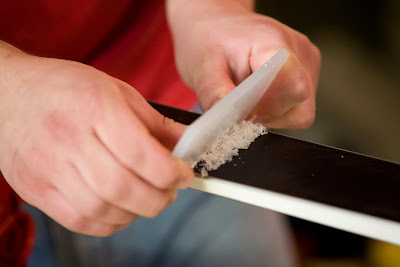 Use two hands to apply even pressure to the scraper, and moving tip to tail, scrape off the wax working in overlapping motions. 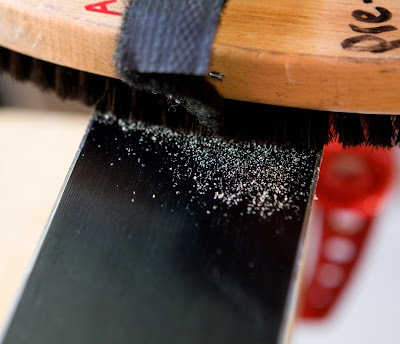 Don’t be afraid to put some pressure on the scraper; the idea is to get off as much wax as possible. This may seem counterintuitive. 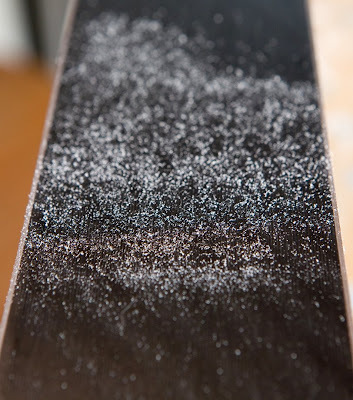 The base of a ski is porous, and the point of waxing is to fill up these tiny pores. Scraping is removing the excess wax that did not make it into the pores. b. Scrape until no more wax comes off. Warm temperature waxes comes off easily, cold wax can take a bit of work. Be mindful to “scrape” the wax off the base rather than pulling it off in chunks. If the wax you are scraping off has turned black, you probably burned either your base or the wax. c. Brushing is also a simple task, and has been explained in Chapter 5. When brushing after waxing, you will kick up little white specs of wax, as shown in the photos below. I start brushing with a copper brush, and finish with the horsehair. The more you brush after waxing, the faster the ski will be.